Light is the task when many share the toil and, building up to the 2017 Kingsbridge Show, there was a dedicated, enthusiastic team of people getting the showground up and running for this year’s eagerly awaited 135th agricultural show. For the past 62 years the panoramic location of the showground has been established, thanks to the generosity of the Smaridge Family in allowing continued use of this glorious site, on the outskirts of Kingsbridge. The enjoyment of so many show goers has been down to the dedication of the Committee and volunteers who spend many long hours of planning, manual labour, administration and goodwill in the year-round task of getting the show ready for the day and the clearing up afterwards. Their hard work is much appreciated and shone through at Kingsbridge’s top social calendar event, enabling things to all run smoothly for the exhibitors, traders and entertainers. 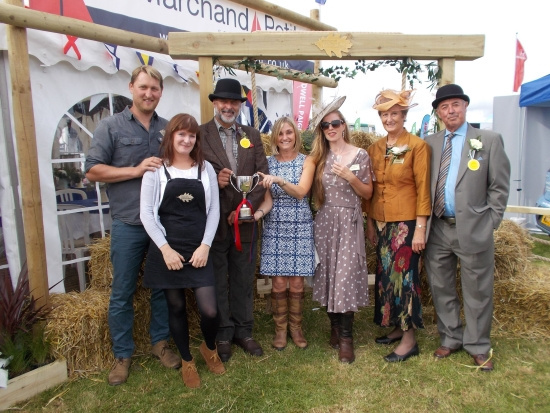 The collaborative partnership of Salcombe Harbour Hotel, Marchand Petit, Garden Time and South Hams Fencing & Landscaping was a winning combination that brought “some down to earth country class to the show” commented Show Chairman Apple Taylor, as she and Jo Lapthorn, Show President, awarded the Best Show Stand cup to the delighted quartet. A thrilled visitor to their stand was Esmae Lilburn, aged 3, when she won the turtle drawing competition held in the Marchand Petit marquee. Esmae received her prize from Alison Theaker who, along with island artist Emma Carter, ran Sea Sense this summer. The Sea Sense workshops, through art, taught local primary school children awareness of the fragility of our marine environment and their created centre piece, Tilly the turtle, made up part of the coastal living theme in the winning show stand. With the straw bales, flower wall and arbour swing seat designed and built by Wayne and Amy Crocker, of South Hams Fencing & Landscaping, and the giant deck chair from the Salcombe Harbour Hotel there was plenty of welcoming seating for visitors to relax and enjoy the hotel’s hospitality and innovative, beach inspired, planting courtesy of Garden Time. For further information please contact Marchand Petit’s Kingsbridge office on 01548 857588, email: kingsbridge@marchandpetit.co.uk.